Zaheen Aeron and Nadia Arias never planted anything in their eleven years of existence. 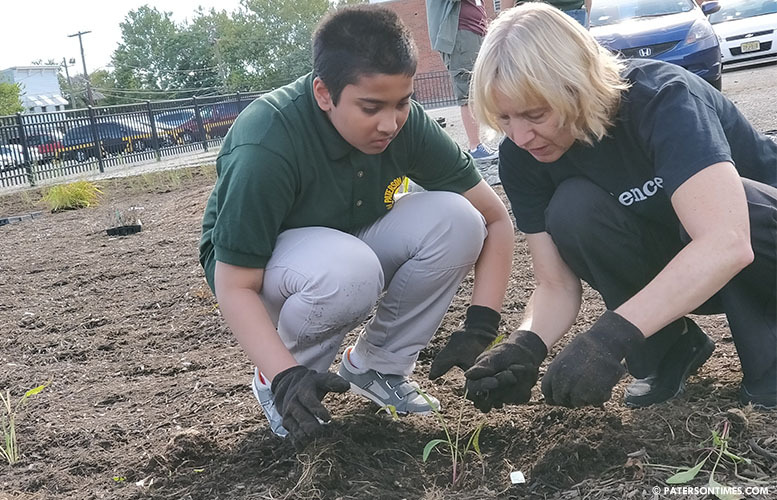 Both students of the Paterson Gifted and Talented Academy wasted no time getting their hands dirty digging through mulch to reach soil and bury roots of switchblade grass plants in their school’s new rain garden. “I’ve done three plants already,” said Arias, a sixth grader at the school. She was among 80 students from School 28 to participate in planting grass and saplings at the rain garden last week in hopes of trapping storm water before it flows into the antiquated municipal sewer system. “We all know plants eat water to survive,” said Arias. Aeron explained the soil and mulch will hold the rainwater water for the plants. “The plants will absorb the water,” said Aeron (pictured, left). Students in sixth and seventh grades learned how a rain garden works from Hazel England, director of outreach at the Great Swamp Watershed Association. She said the students were schooled in the “Paterson water cycle.” A big part of that cycle is the city’s combined sewer system which dumps raw sewage into the Passaic River during significant rainstorms and snowmelts. England said the students understood the need to capture storm water so as to block it from entering the sewer system which handles both sewage and storm water. “They get it,” she said. 500,000 gallons of water will be captured by the two rain gardens at School 28 and School 4. “It’s designed to drain water. It’s going to prevent flooding,” said Maureen Bruins, science teacher at the district. “We’re really trying to help our community.” The asphalt lot of School 28 often has large puddles after a night of rain. Students and school staff are hoping the rain garden will put a stop to those puddles. Students also helped to plant trees – Hackberry, Sweet Bay Magnolia, and Littleleaf Linden. Students traveled to the Great Swamp National Wildlife Refuge to learn about different species of wildlife prior to their planting the rain garden. They also studied native plants and selected which ones ought to be planted in their rain garden. England taught the students to properly bury the roots of the plants into the ground. Once the roots take hold and plants start developing, the rain garden will require minimal maintenance, she said. The School 28 rain garden was the third constructed in late summer. School 28 cost $80,000 and School 4 is $26,000. And the third rain garden was constructed at John F. Kennedy High School which cost $34,000. Students from School 4 planted in their rain garden at the same time as School 28. Kennedy students planted their rain garden this week. All three rain gardens were covered using a $500,000 green infrastructure grant secured by Paterson Storm Water Management Resource Training (Paterson SMART), a coalition of organizations with a mission to better manage storm water through green infrastructure. Funding was provided by the New Jersey Department of Environmental Protection (DEP). Arias sees the rain garden as the school playing a small role in stopping the further pollution of the Passaic River. She had firsthand experience with the water pollution. “It was disgusting to fall into the Passaic River,” said Aris. She tripped and fell into the murky water that has a greasy feel.